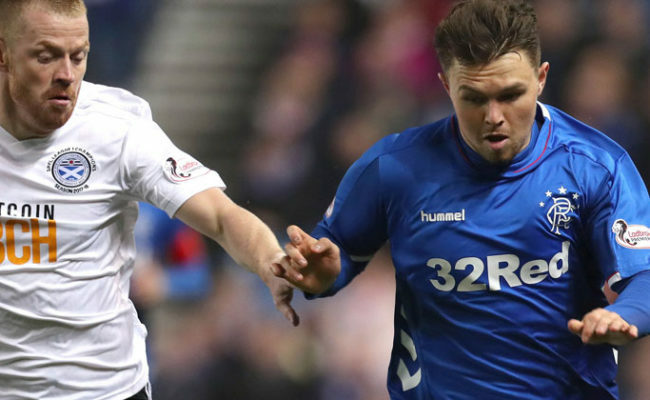 A DEVASTATING second half from Rangers saw them cruise through to the Scottish Cup quarter-finals at Ayr United’s expense this afternoon. On a bitterly cold and, at times, snowy afternoon on the Clyde coast, the Light Blues struck FIVE times after the interval to ensure their name is in the hat for the draw later tonight. After Alan Forrest put Ayr ahead, Alfredo Morelos grabbed two, as did Josh Windass and there were singles for Jamie Murphy and Jason Cummings to warm the 6500 Gers fans on the Somerset Park terraces. On the bumpy pitch in Burns country, Gers had looked composed in the early minutes, and could have taken the lead when a Jamie Murphy shot was deflected high before dropping to the back post where both Alfredo Morelos and Greg Docherty were waiting. Unfortunately, they tangled with each other and the ball went behind for a goal kick with no shot on goal registered. Declan John then shot narrowly wide after a good run into the area from deep, before Ayr were gifted the lead on 12 minutes. A backpass from David Bates to Wes Foderingham was miscontrolled by the goalkeeper, allowing Alan Forrest to slide in to force the ball over the line to hand the home side the advantage. Rangers’ response to that blow was good, creating numerous chances and taking almost total ownership of the ball for the remainder of the half. Russell Martin firstly headed a good chance wide from an excellent David Bates cross when the big defender chased down a loose ball from a corner. 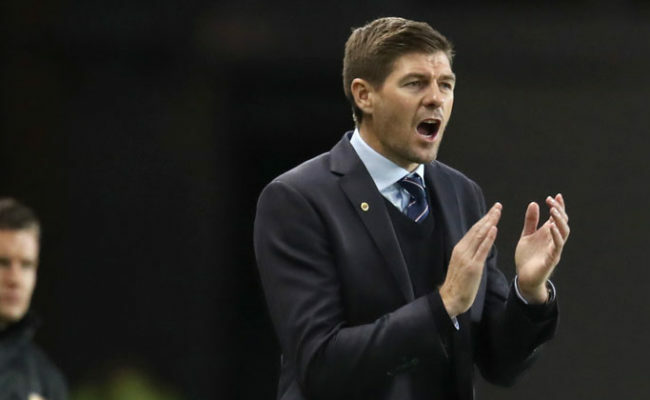 Then, from a quite superb James Tavernier cross, Josh Windass headed against the bar from just outside the six-yard box before Alfredo Morelos missed the most glorious opportunity. Good industry down the right from Greg Docherty saw him burst into the area and slide the ball to the back post where the Colombian was waiting. The ball looked take a bobble just as he went to strike it, with his effort from not more than two-yards out going over the bar. Understandably, his head could have gone down after a moment like that, but quite the opposite happened, as he fired Gers level just over a minute later. The ball initially broke to Sean Goss 25-yards out, and he curled a wonderful effort goalwards only to see it come back off the underside of the bar. The rebound broke perfectly for Morelos inside the six-yard box to fire home and bring his side level on 31 minutes. It could have got better for Gers as half-time approached, with Ruddy forced into saves from Tavernier, Jason Cummings and Windass, but level is how it finished at the break. The start of the second half brought a further obstacle for the players – snow. A blizzard during the break had blanketed the pitch making the already tricky surface even more difficult to play on. The first opportunity of the new half went the way of the home side, with Craig Moore sliding in Declain McDaid only for Foderingham to race out from his goal to smother any potential shot. Soon though, the initiative in the game was regained by the Light Blues, and, Jamie Murphy was denied by the linesman’s offside flag on 61 minutes as he poked in a Ruddy spill. That was just the appetiser however for a devastating six-minute spell for the Light Blues. First up on 66 minutes, Jason Cummings gave Gers the lead in the game with a super finish. Ayr hadn’t set themselves to defend a corner, which Murphy took short to Goss. He curled in a fine ball under no pressure, which, with his back to goal, Cummings flicked into the back of the net. Three minutes later, Josh Windass made it 11 for the season with another fine finish. Declan John played in the Englishman, and his shot beat Ruddy to surely end the game as a contest. Then, a further three minutes later, Windass turned provider to end the game as a contest. Morelos sprayed a ball from midfield wide to the right for Windass, before the Colombian made up the yards to meet Windass’ return ball in the six-yard box to fire home. The Honest Men looked dead on their feet while Rangers were still full of energy, and with nine minutes left, Windass grabbed his second of the afternoon to make it five. Another short corner routine ended with a curling Goss ball to the back post for Windass, and having missed an earlier chance with his head, he made no mistake this time with a bullet-header into the back of the net. Substitute Eduardo Herrera could have made it six, with a flick to a John ball which rolled along the goalline before being grabbed by the grateful arms of Ruddy. With two minutes left, the score did turn over to six, with Jamie Murphy grabbing his first Gers goal. From halfway, Herrera played the ball through for Murphy who did so well to hold-off the challenge of Michael Rose before sliding the ball into the bottom corner. RANGERS: Foderingham, Tavernier, Martin, Bates, John, Goss, Windass (Halliday, 81), Docherty, Murphy, Morelos (Herrera, 75), Cummings (Miller, 75). SUBS NOT USED: Kelly, Cardoso, Candeias, Holt.